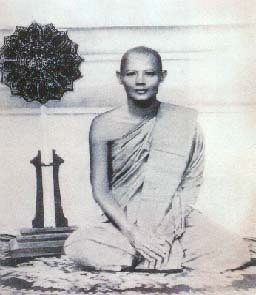 Luang Por Pae was 11 years old, he studied Pali from Pra Ah Jahn Pan and Pra Ah Jahn Pom at Wat Pigoontorng. When he was 14 years old, he went to Bangkok to studied Pali under Pra Ah Jahn Som who was a Cambodian monk at Wat Chanasongkahm. Luang Por Pae at the age of 16 years, returned to Wat Piggontorng and became a novice monk, after which he went to Wat Chaanasongkahm to further his learning in advanced Pali until the age of 22 years old. Luang Por Pae was ordained as a monk at the age of 22 years old at Wat Pigoontorng. Pra Mongkontipmunee (Bangkok) was he preceptor and Pra Kroo Sittidet was his Dhamma teacher. In year BE2474, he became the abbot of Wat Pigoontorng. He re-built Wat Pigoontorng from a old and ruined temple to now, a beautiful and well-known temple in Singburi as well as in Thailand. Luang Por Pae created and chanted the first amulets in BE2482 to raise fund for re-building the temple. Luang Por See of Wat Praphrang helped Luang Por Pae to create the first batch of amulets; Pra Glee Bua and Waen Chaai Ying (Man Woman Ring). From that time onwards, Luang Por Pae became well-known as a monk who was very good in making amulet until the present days. Luang Por Pae amulets are good and well proven, many experiences from people who wear his amulets claimed that his amulets give protection and metta to the wearers. His amulets are very popular in Thailand and also in overseas. The Pra Boo-Cha PraJum Wan (Day Buddha Statue) created and chanted in BE2499, are also top amulets that many people want to find and boo-cha. Until now, Luang Por Pae amulets and statues, every batches and every moulds in the future would be hard to find because Luang Por Pae has already passed away and the price of his amulets would be high. Luang Por Pae passed away on 10th Febuary BE2542 at the age of 94 years old .